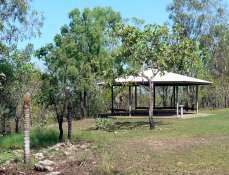 Charles Darwin National Park is a new Australian National Park within the city named after Charles Darwin and on the edge of the harbour named after him. Important mangroves and foreshore are protected by the park. Although not very large campared to national parks such as Kakadu or Litchfield, this area is an important part of the wetland and woodland systems of Port Darwin. Port Darwin is a large and diverse wetland with thirty-six of the N.T. 's 51 mangrove species occurring in its system of inlets, islands and bays. Situated right next to housing and industrial areas, the Park lies on Frances Bay, and includes the bank of Sadgroves Creek, Reichardt Creek and part of Blessers Creek. The Larrakia people speak for this land. Aboriginal people have used the land for thousands of years and the numerous shell middens show it was an important food source. Art by Andrew Bourke near the entrance to the park. 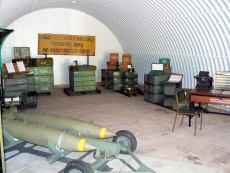 As with most of Darwin, the area was part of the defense preparations and facilities during World War 11 and most of the ammunition bunkers that were built here during this period are still present. Many of the network of walking and cycling tracks throughout the park also have their origins in this period. A display of WW11 photo's and information is open in the Park from 8am - 5pm daily. warning sign says it clearly. 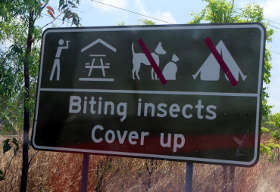 MAKE SURE YOU BRING INSECT REPELLANT ! - this is genuine mangrove wetland country and at times the Midges can be a problem. They breed in the inter tidal zones in the mangroves and are usually worst at sunrise and sunset. 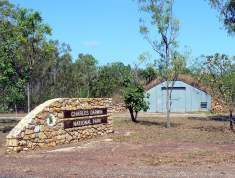 The entrance to Charles Darwin National Park with an old ammunition bunker in the background. Further into the park another ammunition bunker is used to display items from WW11 and the bombing of Darwin. From the top of a small hill a viewing platform gives a good view of Darwin over the mangroves. Picnic facilities and shade are available for use by the public - Don't forget the insect spray. 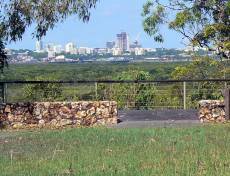 This is an interesting park with a spectacular view of Darwin CBD, lots of walking and cycling tracks,shaded BBQ picnic facilities and is very close to the city. 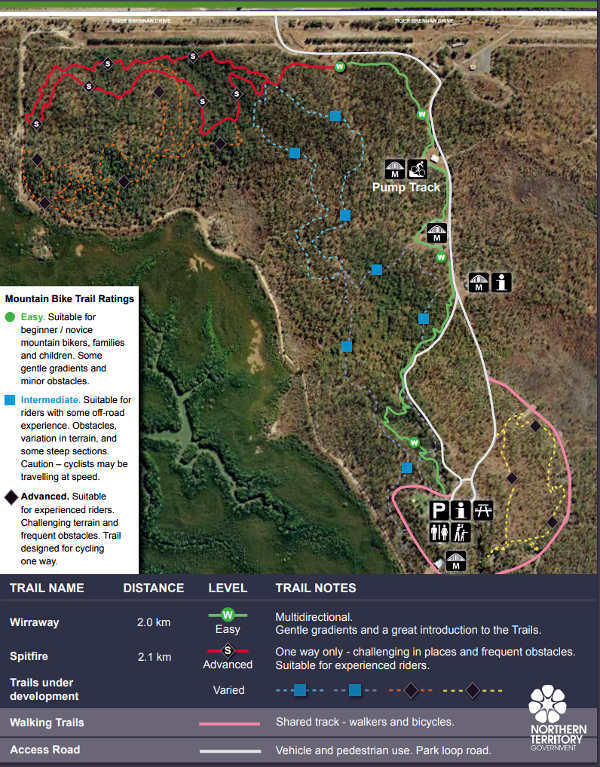 The map below shows the various trail bike rides and walks in the park. Territory Parks Alive is a program of free guided walks, talks, slideshows, spotlight activities and more. The program runs from May to August each year. Activities cater for a variety of ages, fitness and interest levels. For an alternative easy access to mangroves, take a stroll along the Mangrove Boardwalk at East Point to see the Darwin Mangrove Ecosystem at close range. Return from Charles Darwin National Park to Enjoy Darwin Home.